Constructed by Japanese construction giants IHI and a joint venture of Sumitomo-Mitsui and Vinaconex, the Nhat Tan bridge is part of an 8 lane highway that will link Hanoi city with Noi Bai International Airport. The total project is 8.3km long with 1.5km in cable stayed bridges spanning the Red River. When completed, it will connect Hanoi’s city centre to the northern provinces as well as neighbouring industrial zones and urban areas with an eight lane highway. It will also shorten the route from central Hanoi to Noi Bai International Airport. Such multi-span cable-stayed bridges have been used for in France and Greece however it is a new structural form in Asia. 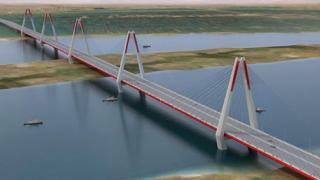 The bridge will adopt steel-concrete composite girders, high-strength stay cables, and high-strength concrete. It is also significant to the construction in the Red River whose annual water level varies 10 meters. Scheduled for completion in 2014, the project is co-funded by the Japan International Cooperation Agency and it is expected the bridge will become a symbol of lasting friendship between Japan and Vietnam.